Campello holidays take you to a charming resort on the Costa Blanca, between Benidorm and Alicante. 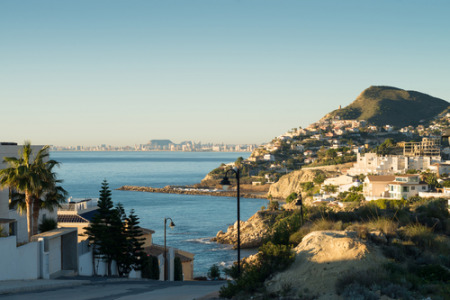 Whilst holidays to Campello can be taken at any time of year, the summers are long and hot and the winters mild, the most popular time to visit is between April and October when temperatures rise from twenty-five to the low thirties. Campello's palm studded sandy beach is gently lapped by warm Mediterranean waters, so it comes as no surprise that holidays in Campello bring families in their thousands. Couples of all ages enjoy a break here. We have a number of cheap Campello holidays that may interest those seeking a guarantee of sunshine in a family friendly resort. Being sandwiched between two large towns, visitors here benefit from extra amenities and there are many activities offering fun for all the family. Our low cost Campello holidays can be as active or as relaxed as you wish, the choice is yours. Those with energy to spare can participate in water sports, play golf, have fun in the theme park or water park, or merely sightsee. With good accommodation, restaurants catering for all tastes and shops and markets for essentials, gifts and souvenirs, our Campello holiday offers are sure to please. For further information and to view our best Campello holiday deals, please use the search facility.